More twins than couple, as this 2008 blog post explains. It takes them 25-30 years to orbit each other and 290 years for the binary system to orbit the Sun. The Kuiper Belt is an eerie, mysterious and cold region of the Solar System. In it, there are billions of small pieces of rocks with lots of fancy names. As a general designation, all objects in the Kuiper belt are called “Kuiper-belt objects” (KBO’s for short). As the Kuiper belt is located in a region just beyond Neptune, they may also be known as trans-Neptunian objects (TNO’s). Inside the Kuiper belt, we have Pluto-like objects known as “Plutoids”, classical KBO’s called “Cubewanos” (the largest being the recently discovered Makemake) and a whole host of other objects such as icy objects soon to become the next generation of periodic comets. 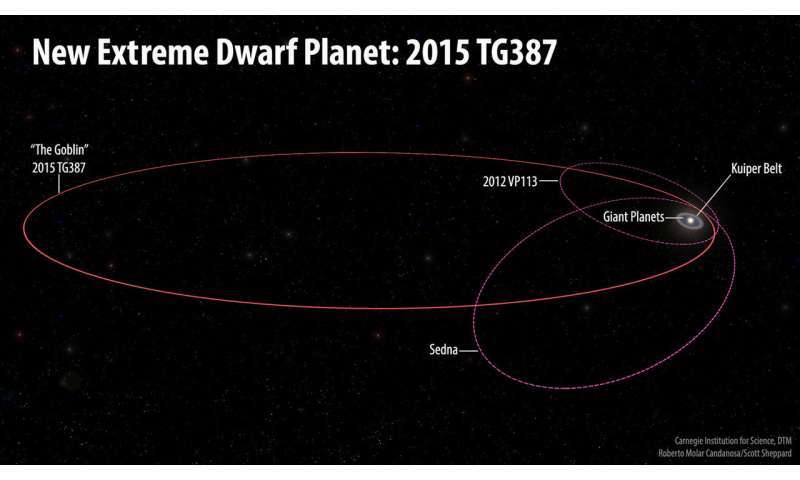 The newly found object, called 2015 TG387, will be announced Tuesday by the International Astronomical Union’s Minor Planet Center. At its furthest point, it reaches all the way out to about 2,300 AU.